Difficulty in emotional regulation has been identified as a major cause of many emotional disorders, some of which are expressed by non-adaptive behaviors. In many cases, the inability to cope with an “unpleasant” emotion that is experienced as emotional overwhelm generates a behavioral difficulty that is reflected in the interactions with others. Despite an awareness of the difficulty and the great motivation to change their behavior, people tend to have little ability to understand its origin. Children and adults with emotional regulation issues display behaviors that are incongruous in nature and intensity with the event that triggered them. Thus, for example, we may witness excessive crying or outbursts of anger following a seemingly minor incident. The environment, which then finds it difficult to understand this kind of behavior, reacts harshly with anger or by punishing. This reaction gives rise to feelings of guilt, and then causes more disproportionate emotional and behavioral reactions. A model that takes into account the emotional difficulties behind this problematic behavior may provide an explanation as to why an event that may seem minor and of little significance leads to a strong reaction that is seemingly not in congruence with what actually happened. According to this model, a bystander, and maybe even the person themselves, sees only two parts of the following sequence: the first stage (the event) and the last stage (reaction). In sessions with parents and children, I explain that one of our goals in therapy is to understand the child’s inner emotional experience and how they react to it behaviorally. It is important to understand that behavior is a language through which children convey their inner world and experiences. Therefore, in therapy sessions, I teach children and parents how to identify things that lay hidden behind reactive behavior. The illustrated cards in Playing CBT facilitate a clear and simple presentation of the ‘inner story’ and ‘external story’, and how an external event triggers an emotional experience that consists of thought, emotion and physical sensation, which in turn trigger a behavioral reaction. The event: the child went outside during recess and saw their best friend playing with another child. The automatic thought that came to them was “Nobody loves me”. The reason: the child thought it illegitimate to feel sad and hurt and did not want to show it, so they preferred to react more like a bully, in a manner that looks more “tough”. What did the teacher see? The child going outside for recess and starting to run wild. Seemingly a child with behavioral problems. The teacher then called the child’s parents and told them that the child went outside for recess and then started misbehaving for no apparent reason. The parents, who obtained only the “external” facts without understanding the hidden part, also reacted with anger. This generates a vicious and endless cycle. In therapy we learn to recognize our emotional experience. Together with the child, we learn to distinguish between negative thoughts and coping thoughts; we learn about the emotions that are hidden under other emotions such as anger, as well as the physical sensation that often characterizes a certain emotion. 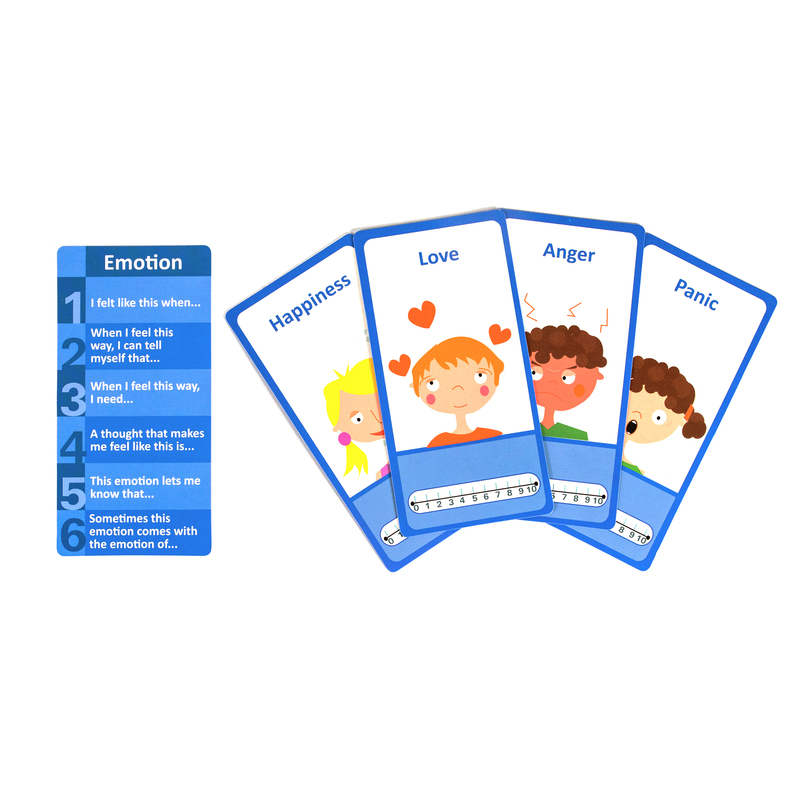 The goal in therapy is to identify the different parts of the story by using the cards that depict a sequence of the external and internal story, and then help the child create a space and leeway between the different parts of the story, and thus allow them to regulate and choose their behavioral reactions.